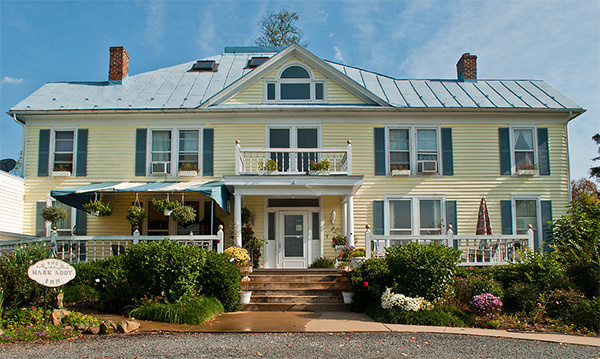 The Mark Addy Inn, near Charlottesville, is a Bed & Breakfast that rests on the sunrise side of Virginia’s magnificent Blue Ridge Mountains, just off the Blue Ridge Parkway, near Wintergreen Resort, Skyline Drive, Thomas Jefferson’s Monticello, and Poplar Forest. Our Inn is beautifully restored and lovingly appointed, and the Mark Addy beckons with the romance and richness of a bygone era. Charming and luxurious accommodations offer elegant comfort, serene privacy, and incredible views of the magnificent Blue Ridge Mountains. During your stay at our Nellysford B&B, travel the scenic, winding roads of our beautiful countryside dotted with family orchards, vineyards, wineries, and breweries, unique antique shops, mountain crafts, artists’ studios, farmers markets, and nearly unlimited opportunities for year-round outdoor recreation. After a day of exploring, return to your romantic escape to relax on one of our six porches, reminisce, read a book in the hammock, or watch the sunset.